Nothing strikes fear into the hearts of yogis like adding “turbo” to the beginning of a pose’s name, and turbo dog probably deserves that apprehension. It is a variation on downward facing dog that targets the triceps (muscles in the back of the upper arms). Pretty simple instructions: start in downward facing dog, and as you exhale bend into the elbows so that they hover just above the floor. Don’t touch the elbows down or you lose the tricep strengthening. Contract the muscles in your shoulders, upper chest, and upper back to keep your elbows from bowing out to the sides; keep your arms parallel. Always keep the abdominals contracted, and, other than the variation in the arms, maintain good down dog form. In nearly every yoga class they tell you to “walk the dog” (press heels down toward the floor alternately to loosen up the calves and hamstrings), so you probably already know about that trick for getting deeper into downward facing dog. But here’s another one that I don’t see around as much. Big thanks to Shakti Mhi for introducing this to me in my yoga teacher training. 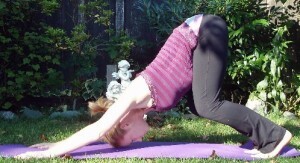 From down dog, as you inhale lift the hips up as high as you can, lifting up onto the toes. Think about tilting the sit bones skyward, which will make it so your low back muscles don’t have to stretch so far. Lift the hips up as high as you can, lifting up onto the toes. With straight legs, tight hamstrings may prevent the sit bones from really tilting upwards, so lets take them out of the equation. On your next exhale, bend the knees. Inhale, tilt the sit bones upwards. You’ll have more space for this now. Exhale press the chest in toward the thighs. Again, since sit bones are tilted upwards and the low back muscles don’t have as far to stretch, you’ll be able to achieve a deeper fold. Exhale, bend the knees. Inhale, tilt the sit bones upwards. Exhale press the chest in toward the thighs. Contract the upper back muscles to slide the shoulder blades down the spine toward the hips. Think about rotating the armpits outwards to open up your chest. Melt the chest down between the arms. Now, once you have the chest pressed as close to the thighs as is comfortable, keep the torso where it is, and slowly straighten the legs. Make sure you keep the muscles around the shoulders contracted to maintain your upper body position. The heels don’t actually have to touch the mat in down dog; some people’s bone structure wont allow for it. Keep the torso where it is, and slowly straighten the legs. Finally, you may have arched you back in order to get your chest in toward your thighs, so contract your abdominal muscles to draw your rib cage and low back into a neutral position. Keep the muscles in the shoulders, chest, and upper back strongly contracted to maintain your form. Contract your abdominal muscles to draw your rib cage and low back into a neutral position.